WE'D GO BACK TO THESE IN A HEARTBEAT! Why? They are breathakingly beautiful. They are far from the madding crowd. And every one of them is worth the hike to get there...and no, they are not in any kind of order...who can choose between these beauties? Who would want to? 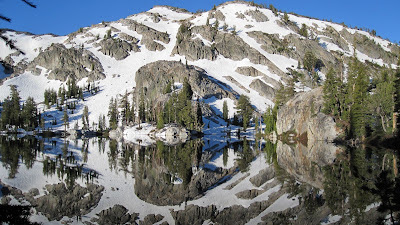 DEVIL'S PUNCHBOWL, JOHN MUIR WILDERNESS: about fifteen miles in from Courtwright Reservoir, Devil's Punchbowl is the real deal--a high alpine lake with towering cliffs, mirror-like reflections, and plenty of trout. BOUNDARY LAKE, YOSEMITE NATIONAL PARK: This is the only one with no fish---but the location, about eleven miles in from Cherry Lake over the Kibbie Ridge Trail, means you'll meet very few people here. And it's surrounded by lovely country. LOWER OTTOWAY LAKE, YOSEMITE NATIONAL PARK: A high altitude lake (above the campfire zone!) that is full of granite islands and peninsulas---just right for privacy. And great fishing. LOWER INDIAN LAKE, JOHN MUIR WILDERNESS: A different kind of lake entirely---vast open spaces surround this lake, giving vistas of the peak for miles around. CINKO LAKE, HOOVER WILDERNESS: A lovely high altitude lake that sits about twelve miles in from Leavitt Meadows trailhead. 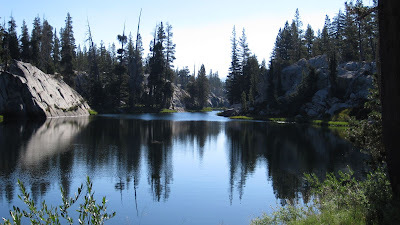 SMEDBERG LAKE, YOSEMITE NATIONAL PARK: Lovely granite scenery, good fishing, and some delightful dayhikes to other lakes nearby make this a favorite of ours.